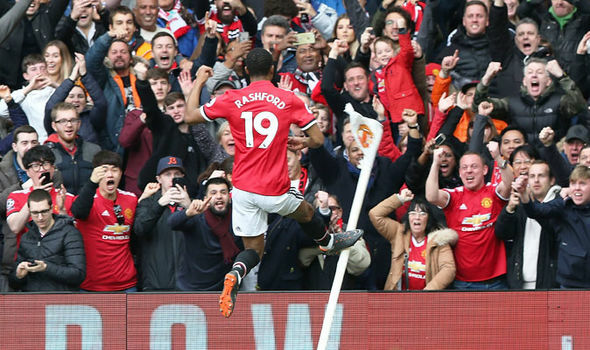 Manchester United have opened talks with Marcus Rashford over a new long-term deal to secure his future at Old Trafford, according to the Telegraph‘s James Ducker. Anthony Martial, another fan favourite excelling under Ole Gunnar Solskjaer, penned a new deal until 2024 on Thursday, ending a prolonged period of speculation over his future. And the club is keen to do the same with Rashford, who has scored six goals in Solskjaer’s ten games as caretaker manager and produced a series of thrilling performances. According to Ducker, writing in an exclusive, Rashford has attracted interest from a number of European suitors – including Real Madrid – but sees his future at Old Trafford. The youngster’s contract expires at the end of next season, although the club can extend that deal by another year to 2021. But United are keen to hand Rashford a new long-term deal to ward off the interest of any potential clubs. United have opened negotiations with the 21-year-old and look set to hand him a contract worth £150,000-a-week, almost doubling his current salary. Martial’s new five-year deal is reportedly worth £200,000-a-week. With the departure of Marouane Fellaini and most likely several others in the summer, United can work on their overly large wage bill and hand new contracts to players who, like Rashford, truly deserve them.